“Yeung Sam Sow”, certainly need help in translation la. 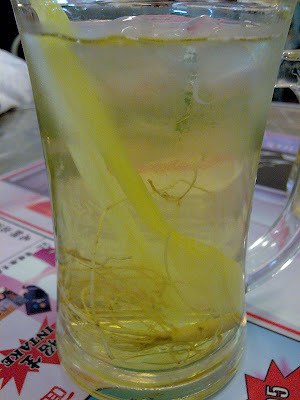 Grown ginseng? 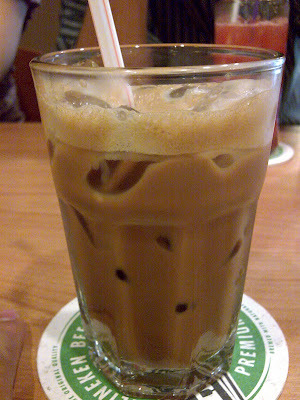 But the cheaper variety la, nevertheless, quite soothing concoction, not too sweet nor bitter. RM1.50 only. So, need a refreshing light meal? Forsake that carnivorous appetite, and try Lui Cha Rice (Thunder Tea Rice? 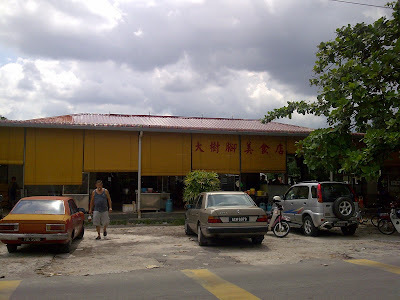 =P) at GT Kopitiam, a 2 shops lot, located facing the vast parking lot next to Old Town Kopitiam at Greentown. Same row with Yeolde English Cafe. We were around Ipoh Garden & Bercham area, for work this afternoon. Not so hot day, thankfully. As i’ve an appt at around 2pm+ around tesco area, might as well find some place for lunch. ‘Dato’ (=P) suggested Fu Tien Vege Restaurant at Medan Ipoh Bistari, right behind Tesco, which serves funky vege food, most noticably their fried sang meen, and various vege sushi. Supposed popular for mango sushi, but last time i ordered Dragon Roll (or something like that), it kinda sucked. Variety of drinks, quite cheap. 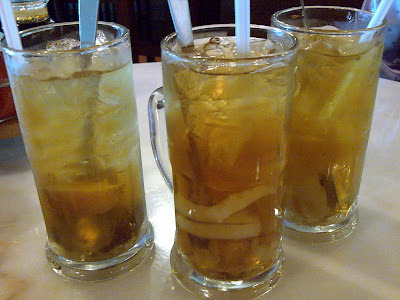 End up we ordered the same drinks type, all ‘leung sui’ category. RM2.50 per glass. Taste? Cooling, not too sweet. Nice. 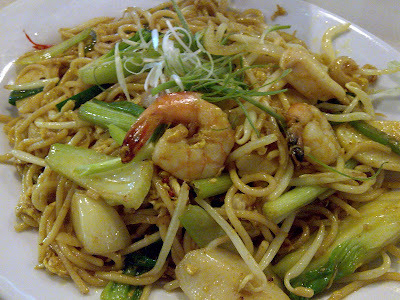 I ordered curry seafood spaghetti, RM8.00. The portion was HUGE! And yet i tot of ordering noodle cz feeling pretty full from FREE breakfast ma … hehe… government personnel meeting ma… typical la… Tastewise? Not spicy, fried with curry powder, quite bland actually. 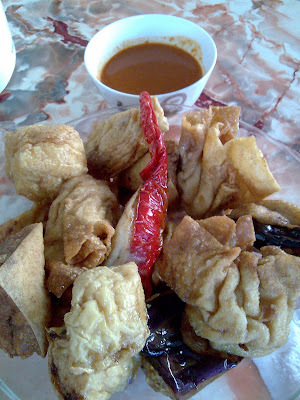 Only consolation is they fried with lots of vege (even pumpkin), shrimps, squids, & fishcake. 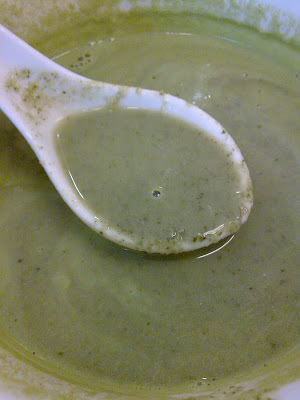 ‘Dato’ ordered this, RM4.50. 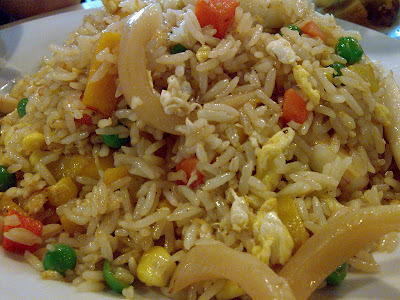 Tasted better than mine, not soggy, and enough ‘wok hei’. 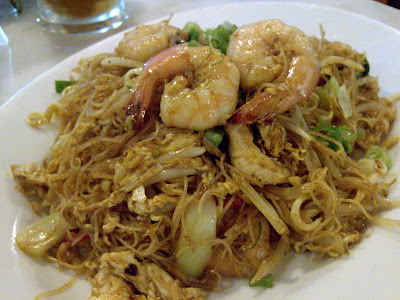 Not spicy also, comes with bean sprouts, shrimps, squids, and egg. If you’re wondering where’s the pumpkins, they are cubed and fried together with the rice. Tall gal (can i use REAL name ah? 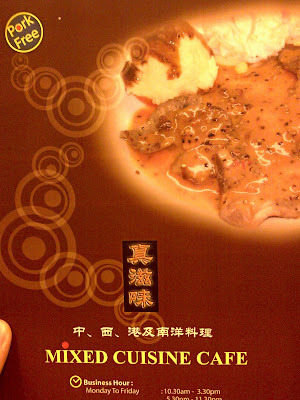 =P) ordered this (RM6.50), but claimed a bit salty. I tasted a bit, was OK, though couldn’t tell the existence of pumpkins anyway. The food comes in HUGE portion la…too huge actually. Maybe they tot ‘Dato’ came to garner support for upcoming election? 😉 Me & Tall Gal din manage to finish ours, but ‘Dato’ did. Bravo! Due to overwhelming workload today, (doesn’t happen a lot, actually, so might as well savour those moments, haha …) we skipped breakfast, but paid the price by suffering through hunger pangs for hours. In the end, we went for lunch a bit earlier (roughly 1/2 hr only la) ,but came to the indecisive point, as usual, on where to go. Results? 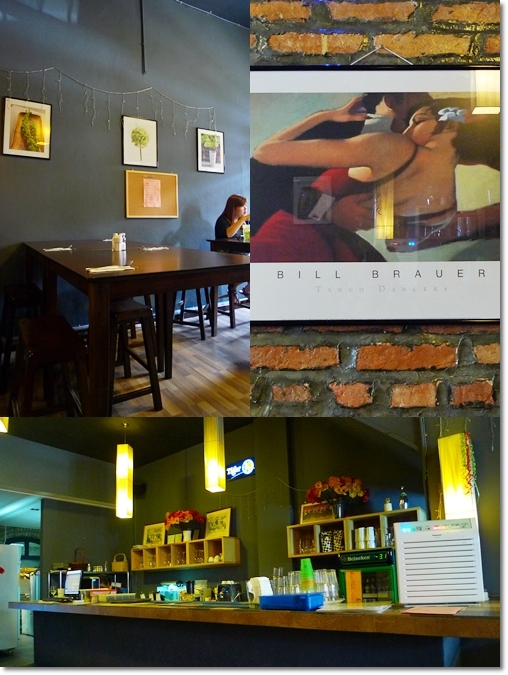 Same old safe choice, Mixed Cuisine, located at Padang Ipoh, Old Town. 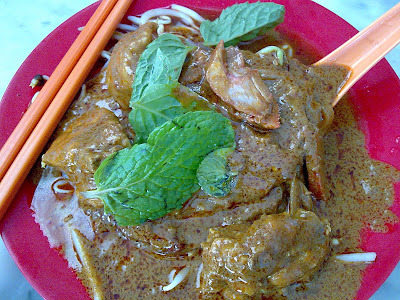 It’s at the same row with Old Town Kopitiam, Ice Ice Baby, and Momo Steamboat Cafe. The last time i had the Grill, it came with beef fillet, but this time around, only chicken and lamb provided, with a chicken sausage. Oh they provide various choices for sauces, eg. Mushroom, Black Pepper, Mongolian (BEST! 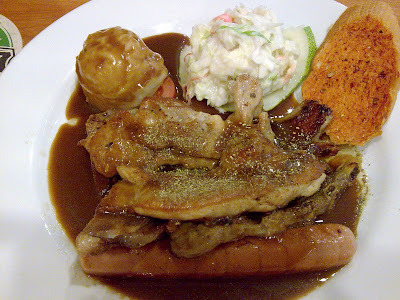 ), Rosemary, Red Wine (add RM2) & Mint(for lamb only). I chose Rosemary today, fairly satisfactory, not too watery or salty, and went reli well with the meat. Sides of mashed potatoes, coleslaw & toasted butter garlic bread. The cincaru seafood rice was tasty, came with prawns, fish, squids, onions, petai, long beans & ladies fingers. 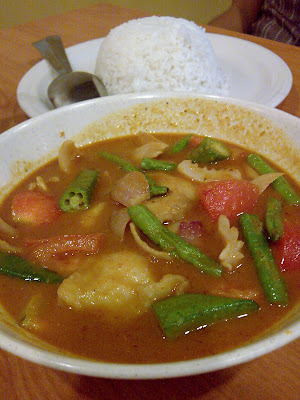 Spicy and sour enough, but not overwhelming.Goes reli well with white rice. Assam seafood on the other hand, cannot do judgment la… tried one small tiny spoonful of gravy only … 🙁 Orange chicken looked nice, but not sure bout the taste. 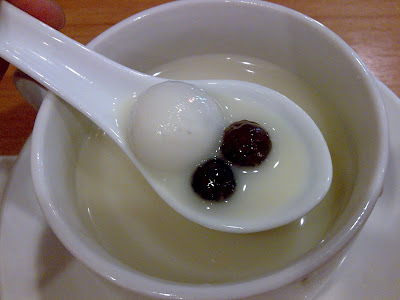 Dessert was good, warm soya bean milk, with 2 tang yuen (glutinous rice ball) stuffed with peanut, and black pearls (those used in concoction of Taiwan Bubble Tea). Overall, meal was considered cheap, and satisfying … then it was time to work again … sigh. 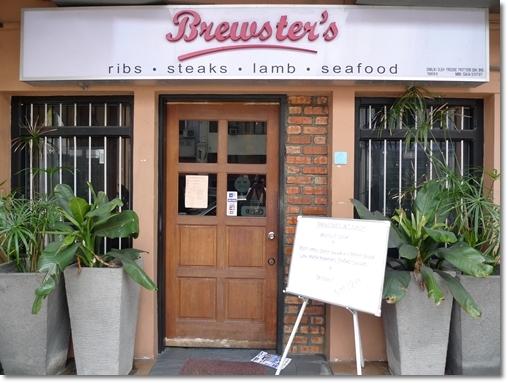 Located at the round about in front of MGS (Methodist Girls’ School), this shop has been around forever …. Or at least as long as i can rmbr. 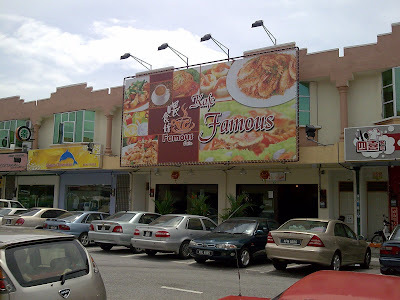 Since i was small my family used to bring me here for the curry mee, ‘pau’, and fried rice/noodle etc. Manned by a family of Hainanese, i felt right at home. (hehe … i am one too). But nowadays i doubt they serve the ‘pau’s anymore. The dry curry mee is still their forte, costing RM3.70 a plate, comes with curry chicken (not shreds only), char siu, & bean sprouts.Tastewise? NICE, spiciness just right. But a tad oily. 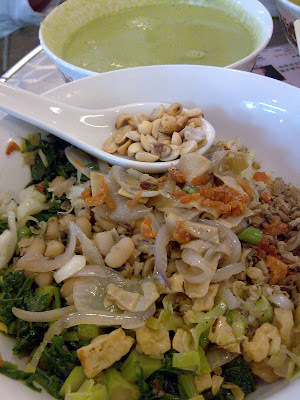 Still digs Nam Chau’s version more … but still, give this a try!